Isolated eyelid Rosai–Dorfman disease without orbital disease or systemic involvement is very rare and needs a high degree of suspicion. In this report, we describe a 16-year-old boy who presented with isolated eyelid Rosai–Dorfman disease involving the right upper eyelid. The lesion was treated by surgical debulking followed by intralesional steroid injection for the residual lesion. The child did well with no evidence of recurrence of the lesion at 1-year follow-up. Rosai–Dorfman disease or sinus histiocytosis with massive lymphadenopathy (SHML) was described by two pathologists Rosai and Dorfman in 1969. They described this entity in young black males who presented with bilateral, painless, massive cervical lymphadenopathy with a waxing and waning course with or without constitutional symptoms. It is one of the non-Langerhans cell benign histiocytosis. It mainly presents as painless lymphadenopathy, mostly cervical (90%) or other nodes with associated extranodal involvement (28%–43%). Among the extranodal sites, eye, orbit, and ocular adnexa are common sites among others. Isolated eyelid lesion with no systemic manifestation is very rare. 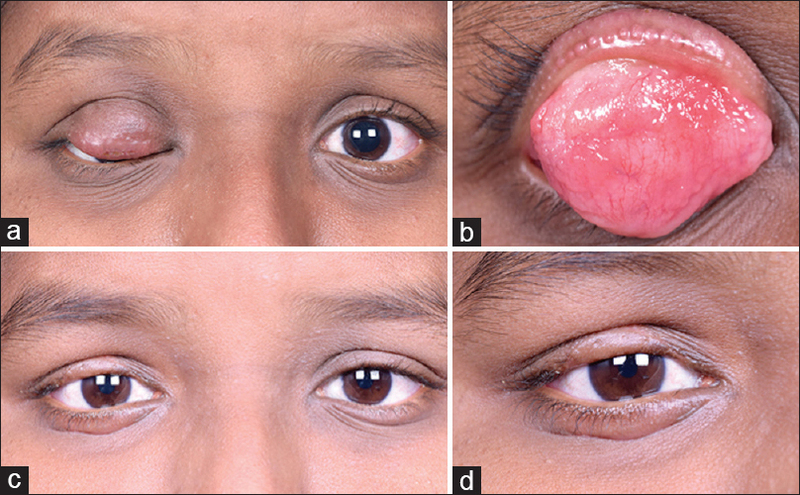 In this case report, we discuss a case of unilateral, isolated eyelid Rosai–Dorfman disease. A 16-year-old male presented with a right upper eyelid mass which was gradually increasing in size and was associated with drooping of the eyelid since 5 months. The patient was being treated conservatively with a misdiagnosis of chalazion. On presentation to us, the child had a well-defined mass in the upper eyelid. There was no significant systemic history. On examination, the visual acuity in both eyes was 20/20. There was a firm nontender mass in the upper eyelid measuring 25 mm × 20 mm × 5 mm and involved the medial two-third of the upper eyelid from the lid margin to just below the orbital rim. Posterior border of the mass was palpable and displayed no fixity to the overlying skin or the underlying conjunctiva. The upper eyelid margin was thickened with loss of eyelashes in the medial two-third [Figure 1]. Rest of the anterior and posterior segment was within normal limits. The left eye was normal. Systemic examination was normal. With a clinical diagnosis of the right upper eyelid benign lesion, excisional biopsy of the lesion was performed. Intraoperatively, the mass was well-defined with a pseudocapsule superiorly but was infiltrating the tarsus and the eyelid skin at the eyelid margin. Near-total excisional biopsy of the lesion was performed and the eyelid defect was closed by direct closure with advancement flap. The excised mass was sent for histopathological examination. Grossly, the lesion was well-defined with the lobulated surface. It was firm and rubbery in consistency. On cut section, it had focal yellowish areas within the lesion. Histopathologically, polymorphous population of cells consisting of mature lymphocytes and plasma cells interspersed with histiocytes were seen. Histiocytes were large with a vesicular nuclei and abundant cytoplasm with engulfed lymphocytes and plasma cells, a phenomenon called lymphophagocytosis or emperipolesis, which is a hallmark of Rosai–Dorfman disease. 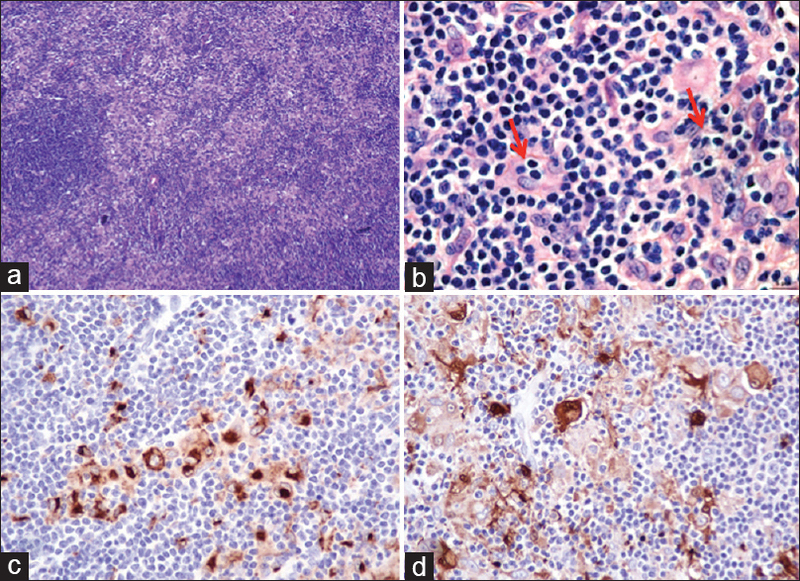 On immunohistochemistry, the characteristic histiocytes stained positive with CD 68 and S-100, thus confirming the diagnosis of Rosai–Dorfman disease [Figure 2]. The edges of the advancement flap being friable gave way after 3 days, and the child then underwent a Cutler–Beard flap to close the defect with injection of intralesional steroids to the residual eyelid lesion. Six weeks later, the flap was divided. At 1-year follow-up, the child is doing well with no evidence of recurrence [Figure 1]. Rosai–Dorfman disease or SHML usually presents with nodal involvement which may or may not be accompanied by extranodal involvement. Presentation to ophthalmology clinics is usually due to proptosis, ptosis, uveitis, or conjunctival mass. In the eye, the orbit is the most common site to be involved. Isolated eyelid involvement without nodal involvement in Rosai–Dorfman disease is uncommon., Eyelid involvement in Rosai–Dorfman disease is mostly by contiguous spread from adjacent tissues such as orbit or paranasal sinuses.,, A single case with eyelid involvement with isolated cutaneous patches over the chest and legs was reported by Prabhakaran et al., in their series of five cases presenting in the orbit and adnexal regions. In a series of seven patients by Vemuganti et al., two cases presented with eyelid involvement predominantly, although there was involvement of adjacent structures too. Thus, suspicion levels are low when isolated eyelid involvement is seen in Rosai–Dorfman disease, making diagnosis even difficult. Rosai–Dorfman disease mainly affects the sinuses of the lymph nodes, and less commonly the interfollicular area of the lymph nodes. The lymph nodes are infiltrated with distinctive histiocytes with round or oval vesicular nuclei with well-defined, delicate nuclear membranes and a single prominent nucleolus. Emperipolesis is the presence of viable lymphocytes (lymphophagocytosis) in cytoplasmic vacuoles of histiocytes and is the hallmark of Rosai–Dorfman disease., In the extranodal variant, more fibrosis is seen with lesser histiocytes and emperipolesis as compared to the nodal variant, which makes histopathological diagnosis difficult. This disease has a waxing and waning course with about 50% of cases needing treatment. Various treatment options include intralesional and systemic steroids, systemic chemotherapy, radiotherapy, and debulking of the lesion depending on the severity of the symptoms and to correct the functional and cosmetic deformities. Recurrences are common and need a regular follow-up. The present case showed isolated eyelid (extranodal) involvement and responded well with surgical excisional biopsy and intralesional steroid. This case highlights that Rosai–Dorfman disease should be considered as one of the differential diagnoses when a patient presents with an atypical eyelid lesion. The authors certify that they have obtained all appropriate patient consent forms. In the form, the patient's patents have given their consent for the patient's images and other clinical information to be reported in the journal. The patient's patents understand that the patient's name and initials will not be published and due efforts will be made to conceal their identity, but anonymity cannot be guaranteed. The support was provided by the Operation Eyesight Universal Institute for Eye Cancer (SK) and Hyderabad Eye Research Foundation (SK), Hyderabad, India. Tan HY, Kao LY. Rosai-Dorfman disease manifesting as relapsing uveitis and subconjunctival masses. Chang Gung Med J 2002;25:621-5. Jogai S, Temmim L, Al-Baghli A, Adesina AO. Rosai-Dorfman disease presenting as bilateral eyelid swellings. Med Princ Pract 2006;15:163-5. Vemuganti GK, Naik MN, Honavar SG. Rosai Dorfman disease of the orbit. J Hematol Oncol 2008;1:7. Zimmerman LE, Hidayat AA, Grantham RL, Chavis RM, Stopak SS, Dreizen NG, et al. Atypical cases of sinus histiocytosis (Rosai-Dorfman disease) with ophthalmological manifestations. Trans Am Ophthalmol Soc 1988;86:113-35. Levinger S, Pe'er J, Aker M, Okon E. Rosai-Dorfman disease involving four eyelids. Am J Ophthalmol 1993;116:382-4. Jat KR, Panigrahi I, Srinivasan R, Singh U, Vasishta RK, Sharma N, et al. Cutaneous Rosai-Dorfman disease: Presenting as massive bilateral eyelid swelling. Pediatr Dermatol 2009;26:633-5. Pelletier CR, Jordan DR, Jabi M. Bilateral eyelid edema: An uncommon presentation of Rosai-Dorfman disease. Ophthal Plast Reconstr Surg 1999;15:52-5. Prabhakaran VC, Bhatnagar A, Sandilla J, Olver J, Leibovitch I, Ghabrial R, et al. Orbital and adnexal Rosai-Dorfman disease. Orbit 2008;27:356-62.